Sign advertising "Hopalong Cassidy" on KWBW radio. Masonite sign shaped like a waving flag on a wooden pole. 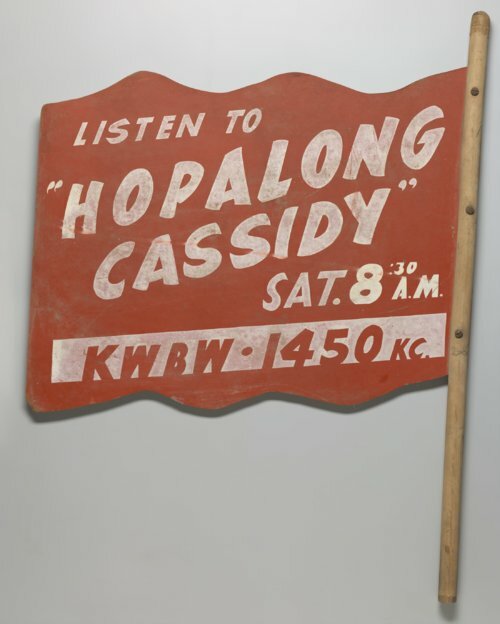 The sign was used to advertise the "Hopalong Cassidy" radio program on KWBW in Hutchinson, Kansas. "Hopalong Cassidy" was a popular radio program that ran from January 1950 until 1952. The character was created by Clarence Mulford and appeared in a series of short stories and books, beginning in 1904. "Hopalong Cassidy" became so popular as to appear in films, television shows, comics, museum exhibits, and even its own amuseument park.